Do CAC Green Stickers Add Value to a Coin? Do CAC Green Stickers Add Value? Anyone who has followed coin collecting closely no doubt has encountered the "Green Sticker", slang for a CAC label attached to a slabbed coin. Let's decipher this lingo. 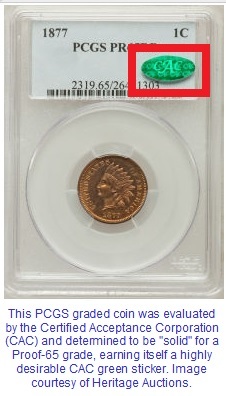 When mentioning CAC Green Stickers, a slabbed coin pertains to a coin graded and encapsulated by the PCGS or NGC grading services. CAC stands for Certified Acceptance Corporation, an organization founded in 2007. The CAC closely studies a slabbed coin and renders an opinion if the coin is correctly graded, overgraded, or undergraded. If CAC verifies the coin meets the standard for strict quality for its grade, it earns a CAC green, tamper-evident holographic sticker, affixed to the slab. It is a signal the coin is "solid" for its grade. Coins that are judged to be borderline for its grade or overgraded get no sticker at all. Those that are undergraded get a gold CAC label -- but we'll save that topic for another time. Hundreds of thousands of coins have been submitted to CAC over the years. The incentive for collectors is the hope their coin will appear "solid for the grade" in the eye of the CAC evaluator and will earn a Green Sticker. Since the Green Sticker has become a telltale sign for quality on the marketplace, it is more likely to sell for a better price when compared to an otherwise virtually identical coin (i.e. same coin type, grade, grade service, etc. ), at least so goes the theory. 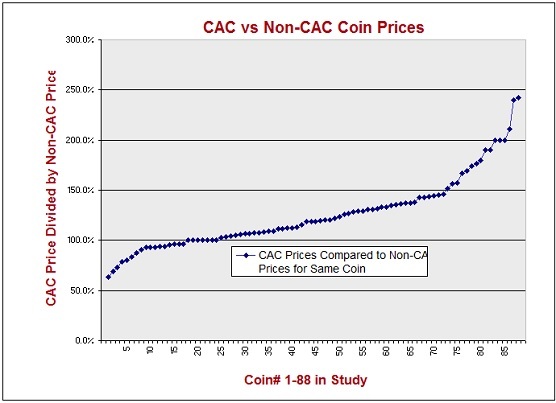 Does anyone really know how much more a CAC coin is likely to bring versus its non-CAC counterpart? Has there ever been any data gathered to validate the claim that CAC coins are worth more? The answer is yes, there has been. In fact, if you write to the CAC, they'll send you a PDF of a study they did several years ago to bolster this claim. Trust but verify. These are words that have resonated with me since the 1980's. Thankfully, several of the large auction houses have searchable databases available online of many thousands of coin sales. I tapped into some of this data to do a small scale research project of my own. My goals were to estimate: (A) how often CAC coins sell for more than their non-CAC counterparts, and (B) the average percentage premium generated by the CAC green sticker. Step 1: For a given recent sale, pulled out all the CAC coins. 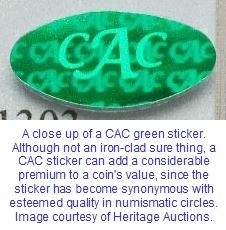 In a sale of a three thousand coin lots, typically a few hundred of them carry the CAC green sticker. Step 2: For the CAC coins, pull out matching coins from remainder of the sold coins from the sale. Definition of a match: same coin type, date, denomination, variety, grade, and grading service. Step 3: If one of the coins in a matched pair had some other degree of separation, such as color (if applicable -- for example, Red or Red-Brown), a "Plus", "Secure" or some other type of additional quality indicator, or anything else, it was removed from the study. The objective of Steps 2 and 3 was to get the best "apples to apples" comparison possible. Step 4: Go to another set of auction sale results and repeat Steps 1 through 3. Please note this methodology only isolated matches within the same sale. In other words, both coins in a matched pair were sold at essentially the same time. One could argue it would've been acceptable to match pairs sold a few months apart, but there was no trouble gathering data points for the study with this approach. Thus, all matched pairs were sold literally within hours of one another. Four sets of auction results were analyzed, covering 10,000 lot sales, from which 90 fully matched pairs were distilled. Step 5: Compute the percent difference selling price of the matched pairs accordingly: CAC coin/Non-CAC coin, and sort from lowest to highest. Step 6: Discard outliers. There were only two outliers, one the high side and one on the low side, leaving 88 pairs in the study. Step 7: Create a chart to represent results of the study and perform other statistical analyses. Bottom Line: Yes, the vaunted CAC Green Sticker DOES INDEED tend to improve the selling price of a given coin when compared to its non-CAC counterpart. On average, this premium is about 25%, but this should never be viewed as an absolute rule. Your CAC coin may or it may not sell at a premium, but the odds are good that it will, although the size of the premium (if any at all) could be small or very large.